« All Slurps On The 10 Nissin Cup Noodles Flavours. I don’t do a lot of invited reviews these days, mostly due to work commitments and staying quite a fair bit away from the city. However, every now and then there are something intriguing enough that warrant the time and effort. 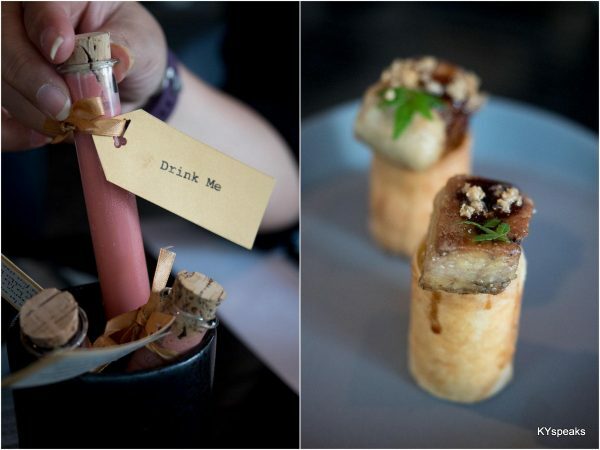 The invitation for Festive Menu at Babe Gastro was one of such events. 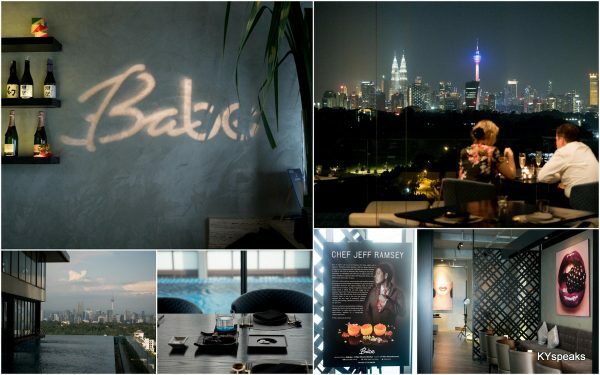 Located at the top floor of Clearwater at Damansara Height, Babe is a tastefully decorated cozy restaurant with a perhaps one of the best views of the city. There’s the infinity pool, an unobstructed post-card worthy view of KL, neat looking cutlery imported from Spain, and even air conditioned alfresco dining area. What’s there not to like except? Well, there’s the rather confusing elevator system where you have to select which floor to go BEFORE getting in. Babe is headed by Chef Jeff Ramsey, a Michelin starred chef who previously headed the Tapas Molecular Bar at Mandarin Oriental Tokyo. The menu here is a unique creation of Jeff Ramsey using a lot of Japanese & other international ingredients while infusing local flavors. 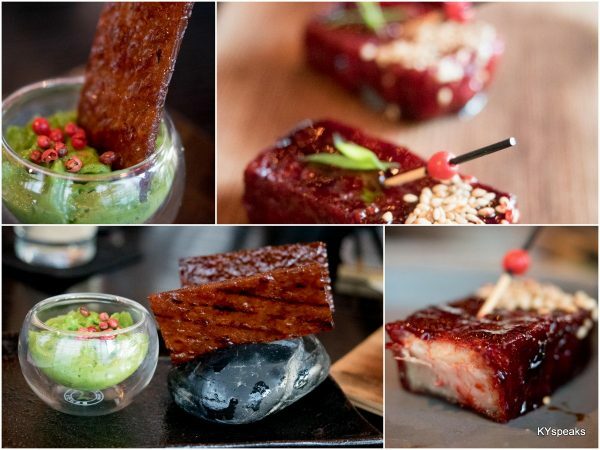 Some of these are coined “Japas”, or Japanese style tapas. While “fusion” has a bit of a negative connotation, I love chefs who aren’t afraid to experiment and push the boundary in culinary space. Without these trailblazers, we’d forever be stuck with “traditional” dishes. What’s the fun in that? The Festive menu is perhaps the most unique buka puasa meal you can get this Ramadhan season. Priced at RM 300++ per pax, the 12-course dinner is available from 26/5/2017 to 30/6/2017. 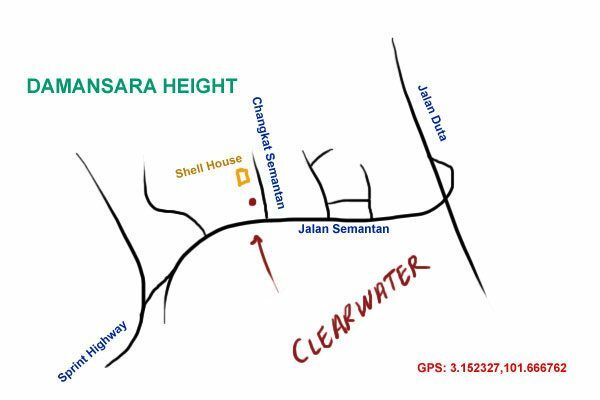 If you are tired with the same Selera Kampung buffet, this would be a place worthy of your consideration. We started the night with “down the rabbit hole”, a shot of drink that tastes like chicken rice, or roti canai, or something that’s completely unfamiliar. An interesting start, and certainly a precursor as to what to be expected for dinner. The first course was Foiegras and Jackfruit, finely chopped jackfruit in a crispy shell and foie gras proved to be a good combination and served as a perfect start to open up our appetite. 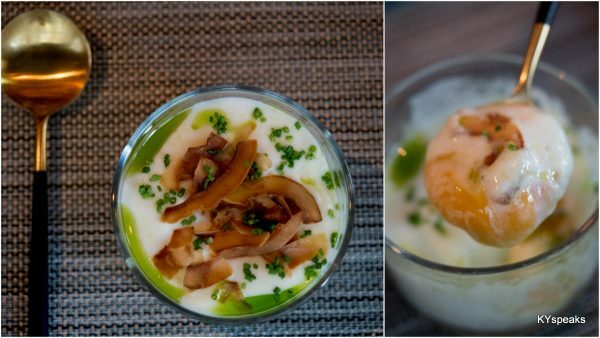 Then came Onsen Chowder, a potato mousse with smoked coconut, 63c egg (molecular gastronomy magic), and chives. It was actually unexpectedly good! The smoked coconut, or what Celina the “top babe” described as coconut bacon brought the dish a very unique crispy contrast to the texture of the potato mousse. Then there was Laksa Injections and Mango & Curry Sphere. 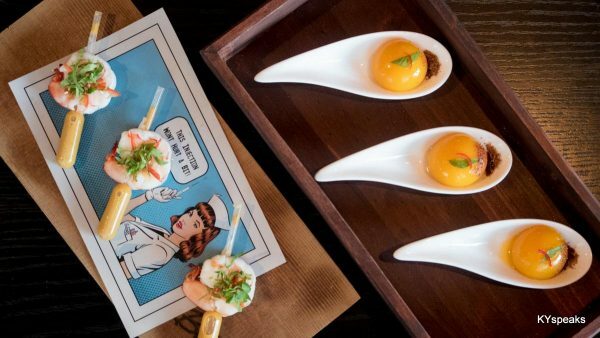 The former is like mouthful of my favorite ingredients in a bowl of curry laksa – prawn & soup, though perhaps a slightly bigger syringe that contains those soup would make it even better. Mango & Curry Sphere utilizes another Molecular gastronomy technique called “spherification”, utilizing calcium chloride or some other voodoo in making an eggyolk lookalike sphere that explodes in your mouth with the tangy & spicy taste of the liquid ingredients within. Quite an experience. 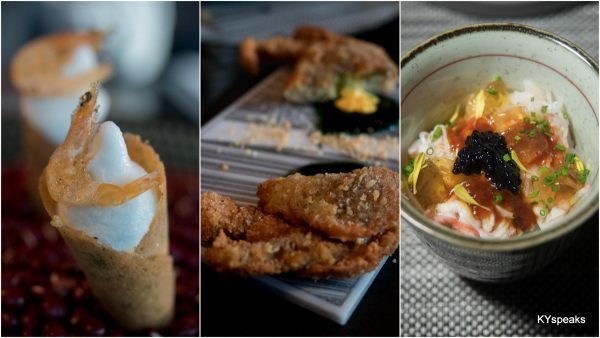 Next were two of the more creative dishes that may looks and taste almost exactly alike what they are supposed to be, but made up of entirely different ingredients that is halal. Crispy Chicken Terrine looks and taste like a good piece of charsiu, but actually made up of up to 40 layers of crispy rendered chicken skin (sans the fatty part) and charsiu sauce, while Marinated Roast Kabayaki Ikan Keli is their interpretation of bak kwa, but instead of pork/chicken, catfish is the main ingredient. I’d have never guessed the ingredients in a million year. Next up was Prawn and Curry Leaf Ice Cream, which was quite a unique combo, you don’t have a seafood ingredient with ice cream very often. Manga Crab is perhaps one of the more “normal” dish, but they actually print the sauce on the plate manga style, and serve with coriander sauce. Snow Crab Donburi with Sambal is basically just as what the name suggests, a small portion of snow crab rice bowl, but with sambal and Dashi jelly to give it that extra dimension. To be honest, I may enjoy this without the sambal just a tad more, maybe. If you’re still hungry by this time, well, afraid not. The Smoked Chicken Percik is a whole ayam kampung to be shared by two. 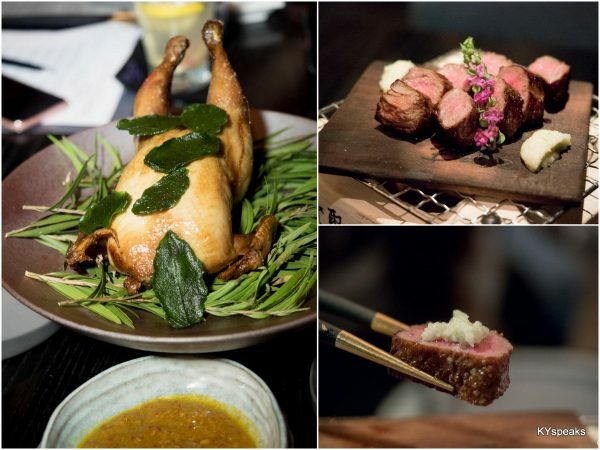 Four hour was spent preparing the chicken, and the result was a prefect tenderness and flavor, definitely one of the benefits of utilizing molecular methods in traditional dishes. Stanbroke Farms Striploin with Japanese Sambal was another welcoming meat base dish which I really enjoyed, especially with the accompanying Yuzu Kosho Sambal. 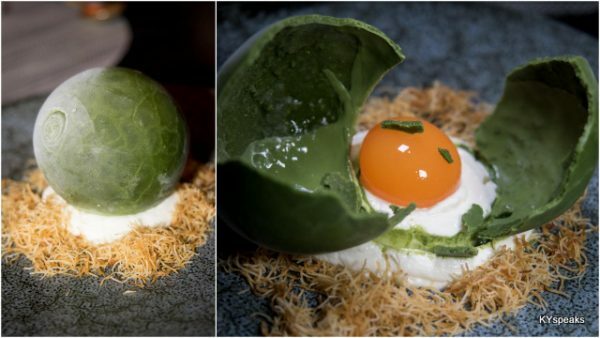 Then came the twelveth course – another playful dish by the name of Dinosaur Egg, a dessert made from DaunKaduk, Yoghurt, Tropical Fruit, and Nutty “Birds Nest”. Crack it open with your spoon and viola, an egg looking thing that by now, you should know it tastes entirely not like an egg, but a sweet concoction that’s apt to end the night.